Check out the Back Roads of the Stunning Volcano Arenal! If you are an avid mountain biker and want to check out back roads of the stunning Arenal Volcano, you’re in for a treat. 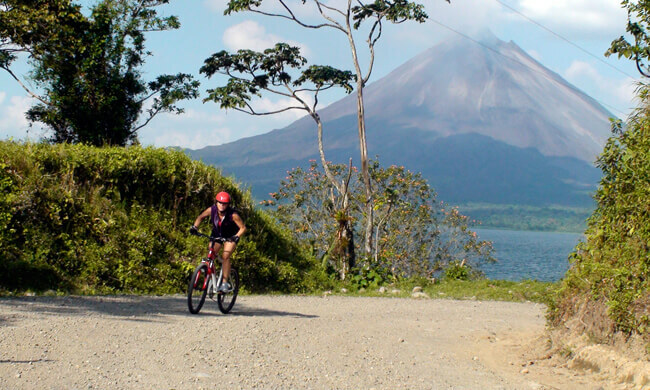 There are paths with different difficulty levels to choose from, such as a moderate scenic route along Lake Arenal, where you can get excellent views of the volcano, surrounding jungle and the farmlands, or a moderate-to-challenging ride that will take you along back roads and windy hills, as you pass through quaint, little countryside pueblos. Your experienced guide will have you make stops at some fun swimming holes to cool off and take a breath. Tour logistics: We pick you up at your Arenal hotel and head out to the starting point on an old road connecting Arenal dam with the main entrance to Arenal Volcano National Park. Your guide will get you set up with your suspension bike, helmet, and gloves, go over the safety talk, and then take off on a very scenic, easy-going ride. You’ll be traveling a distance of about 12 to 26 km (8 to 16 miles) and gain about 85 meters (280 foot) of altitude on secondary gravel roads. Along the ride, be always on the lookout for howler monkeys and exotic tropical birds like toucans, oropendulas, and kingfishers. Difficulty level: beginner to challenging. Ask your travel consultant for details. Includes: transportation from/to your hotel, brand-name, professional suspension mountain bikes, gloves, helmets, bike guide, water break. What to bring: comfortable clothes for biking, swimsuit, appropriate shoes, sunscreen, sunglasses.